Charles This is a point that has come up a couple of times recently on SL (I'm thinking of the big bulge and sake bottle shape pages). It's something fairly evident, but perhaps rarely formulated. There are shapes of one colour that have names, and then a question about how many stones of the other colour one can add and still usefully apply the name. We know that the empty triangle must be empty! 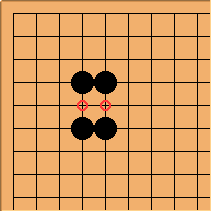 We can only call this black formation an empty triangle if there is no white stone at the circled point. We would only call this a bamboo joint in case both circled points are empty. In general, it seems, there are some covert 'rules' about the sensible matching of patterns with shape names. Sebastian: What about the knight's move - do the squared points have to be empty? Charles I say yes. So I don't like the keima attachment page title. Sebastian: But this is always a kosumi, regardless of what's on the squared points? Charles Pretty much: see also diagonal attachment. Charles Still relevant in 2005! The discussion at farmer's hat for example. I say it's only a farmer's hat if there are no further connected black stones, and at least one empty triangle. But there seems to be a kind of madness associated with definitions. Why not ask what it's all for, as well? Imagist I played something along the lines of in a handicap game, not ten minutes after telling my opponent about empty triangles being bad. My opponent said, "Hey, isn't that bad?" Trontonic My impression is that empty triangles are only okay when closing off territory and/or with extensive reading (of course). 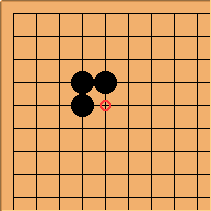 I tried playing without them and found that to be the place were they were actually good moves. fractic: That's more a case of bad shape being mostly irrelevant during endgame. 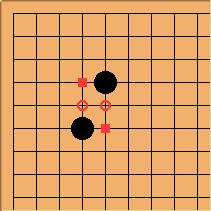 In the endgame all that counts is points, since all groups are settled bad shape is less of an issue.